Did you know that computer viruses affect 40% of U.S. households annually? If that weren’t bad enough, the total losses incurred from viruses, malware, and spyware together top out at $4.55 billion! Currently, more than 1 million new malware threats are engineered daily, and it’s more important than ever to protect your computer. Before now, though, “protecting your computer” has meant installing ineffective programs, or tiptoeing around hazardous sites and phishing emails. Fortunately, there’s a new way to protect your computer from threats – without changing the way you use it: Dave’s Antivirus. As a computer repair professional, I know how common computer viruses are. I also know how devastating they can be. From dumped data to stolen passwords and account numbers, viruses can wreak havoc on your operating system and your life. This is why I build Dave’s Antivirus. 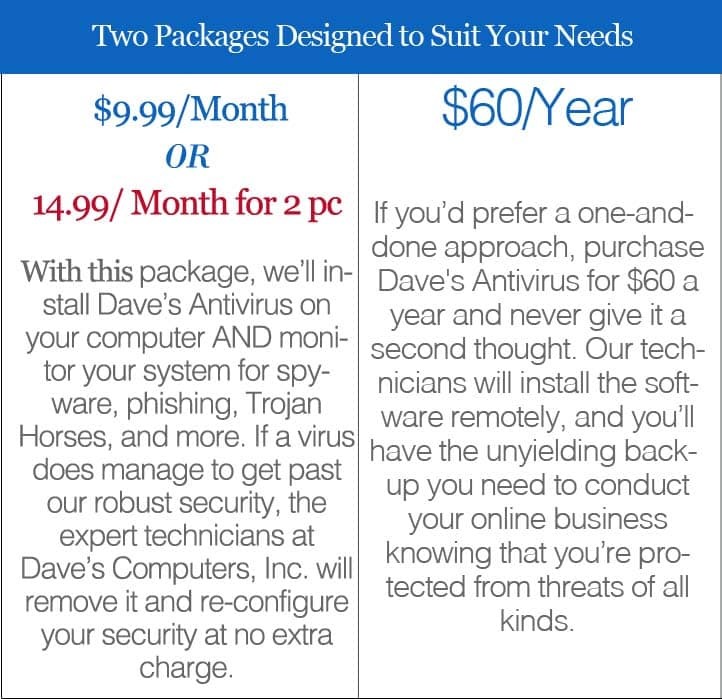 Business-grade software designed to protect your computer from daily threats, Dave’s Antivirus runs in the background and blocks attacks while you work or play. So surf, download, and share in peace: you’ve got powerful antivirus software on your side.